Plastic debris is one of the biggest threats to marine mammals. The survival of at least 100 species could be in jeopardy if we continue to allow 8 million tons of plastic to enter the ocean every year. About a third of the estimated 5.25 trillion pieces of plastic in the ocean have accumulated in what’s known as the Great Pacific Garbage Patch, an area between California and Hawaii. Now several recent innovations are aimed at cleaning up the ocean, both on the open seas and locally in harbors and marinas. The Ocean Cleanup Project has embarked on the most ambitious plan yet to reduce the Pacific gyre by 42 percent over 10 years. They want to lay out a giant array of floating barriers 100 km long that acts as a filter driven by the ocean currents. It would collect particles like plastic or other debris. Leading up to full deployment in 2020 the group is working on prototypes and tweaking the design in scale model testing. Engineers have proven the concept in a small scale application and plans to conduct a coastal pilot off an island in Japan in 2016 with a 2,000 meter barrier. On the local side, two Australians have come up with a way to easily filter local harbors and marinas. 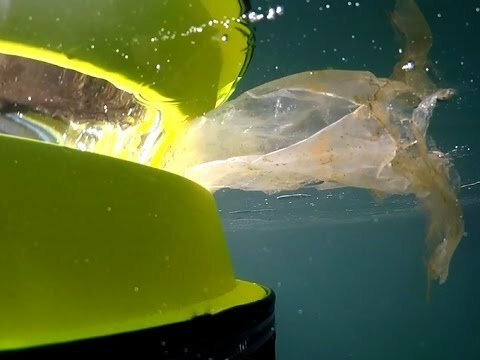 In what’s known as the Seabin Project, vacuum-like devices are deployed in the water. Using what looks like a garbage bin that floats and a water pump on shore, the device filters out physical debris like plastic. The company has turned to Indigogo for support to build a production facility, toward which they’ve raised more than $250,000 so far. They already have a workable design that can also be fitted onto boats so that you too can become a part of the solution.